Boost pedals are conceptually simple devices that ramp up the level of your signal to push the front end of your amp a little harder to bring on a little natural overdrive. 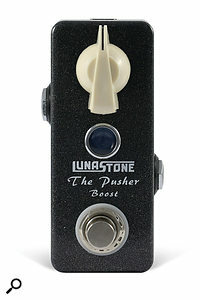 The one-knob, true-bypass Lunastone Pusher does essentially that, and its mini-pedal format makes it easy to accommodate on a pedalboard. Other than the footswitch and level control, there’s just a blue indicator lamp to let you know that it’s active. As with most mini pedals, it requires an external 9V, centre-negative PSU (it takes just 2mA). If simply adding gain was enough, I could draw you a circuit to do the job in five minutes, with a parts cost around the same as a pint of beer. However, designer Steen Grøntved wasn’t interested in designing just another booster: the story goes that he got hold of all the competition and subjected them to rigorous listening tests before deciding that he could go one better by adding some very subtle tonal shaping and other tweaks. He says his prototype ended up being a fairly simple circuit but there were problems porting this to the mass-production methods, which would be necessary to keep the cost of the pedal realistic. His first attempt was well received but he still wasn’t happy, so withdrew it while he further refined the design until he had what we have on review here. 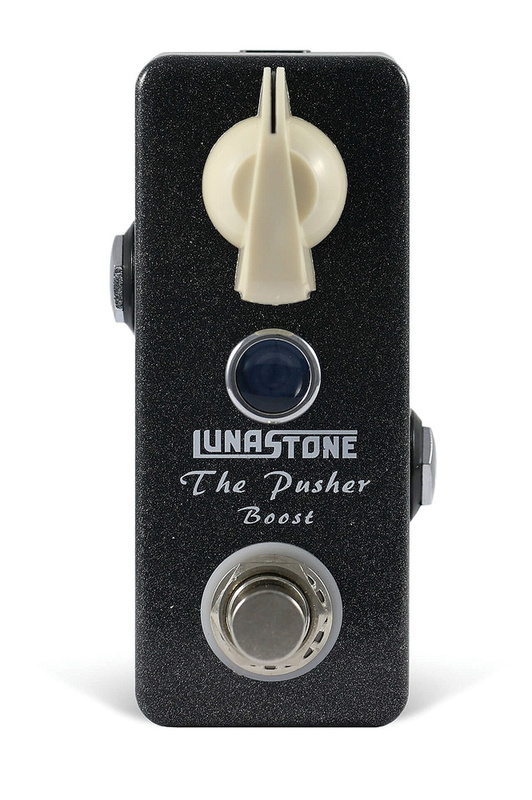 The pusher can provide up to 15dB of boost and manages to combine a subjectively transparent sound with just a hint of tonal flattery. I found that the first half of the control travel produced little gain change, with most of the action taking place in the second half, but it’s still very easy to set the boost you need. There still seems to be a little boost at the minimum gain setting, but it’s very tempting just to leave the pedal on all the time and control the degree of amp drive from your guitar’s volume control. Even with a non-valve amp, such as my Roland Blues Cube, the effect of pushing the front end sounds very ‘organic’, while in a recording situation the Pusher would make a perfect impedance matcher for feeding a guitar into a line input. This may only be a booster, but it’s a very elegant one!